Free soloing, Honnold's specialty, is a type of climbing performed without a rope, a partner, or hardware?such as pitons, nuts, or cams?for aid or protection. The results of climbing this way are breathtaking, but the stakes are ultimate: if you fall, you die. In Alone on the Wall, Honnold recounts the seven most astonishing climbing achievements so far in his still-evolving career. He narrates the drama of each climb, along with reflective passages that illuminate the inner workings of his highly perceptive and discerning mind. We share in the jitters and excitements he feels waking in his van (where he lives full time) before a climb; we see him self-criticize in his climbing journal (a veritable bible for students of the sport); and we learn his secrets to managing fear. 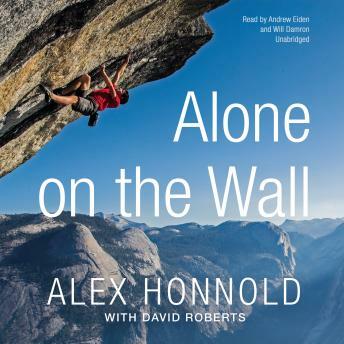 Veteran climber and award-winning author David Roberts writes part of each chapter in his own voice, and he calls on other climbers and the sport's storied past to put Alex's tremendous accomplishments in perspective. Whenever Honnold speaks in public, he is asked the same two questions: "Aren't you afraid you're going to die?" and "Why do you do this?" Alone on the Wall takes us around the world and through the highs and lows in the life of a climbing superstar to answer those fascinating questions. Honnold's extraordinary life, and his idiosyncratic worldview, have much to teach us about risk, reward, and the ability to maintain a singular focus, even in the face of extreme danger.